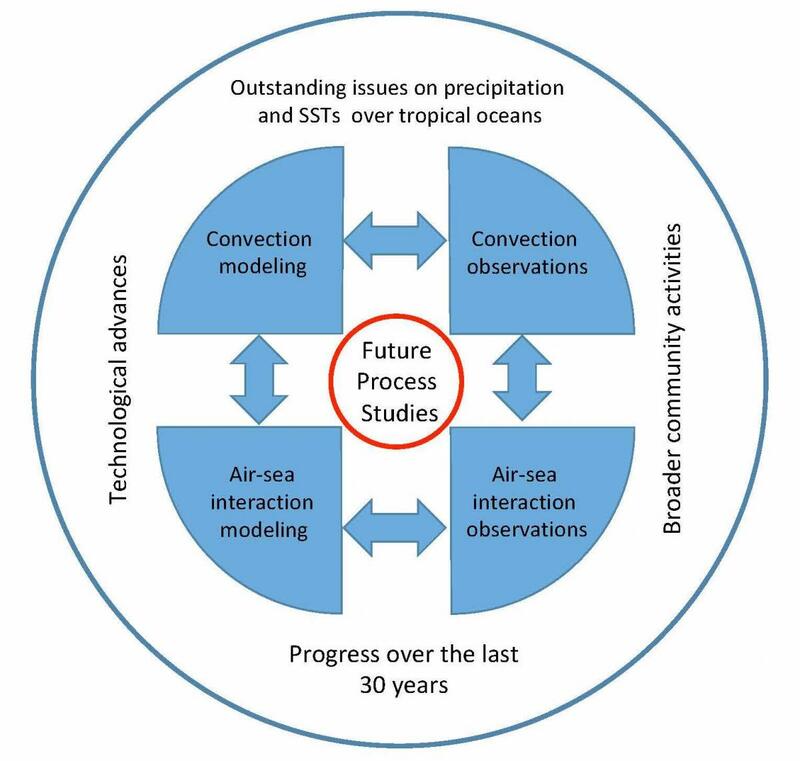 Over the last thirty years, the scientific community has made considerable progress in understanding tropical convection and air-sea interactions, thanks to sustained investments in extensive in situ and remote sensing observations, field experiments, advances in climate modeling, and vastly improved computational resources. Such investments would not have been fruitful if it were not for integration and the collaborative spirit of research in the atmospheric convection and air-sea interaction communities. However, challenges still remain and point to the limitations in our understanding of air-sea coupling, especially when convective processes over a broad range of scales and teleconnections are involved. Advances in technology and increases in societal demands for improved prediction accuracy are raising the expectations for scientific outcomes. The technological advances include innovative in situ and remote observing platforms and instruments, expansion of computing infrastructure, which enable global convective and ocean-eddy resolving climate modeling, and data analysis and processing capabilities, such as machine learning and data assimilation. These advances are taking place in the context of evolving broader research priorities and community activities, such as the increased recognition of the need for understanding the predictability and improving prediction skill at subseasonal to decadal scales (e.g., S2S Prediction Project, Coupled CMIP6 projects) and designing an integrated and sustainable approach to remote sensing and in situ observations (e.g., the 2017-2027 US Decadal Survey for Earth Science and Applications from Space, Tropical Pacific Observing Systems 2020). This workshop will help the tropical convection and air-sea interaction communities strategize for effective use of these advanced technologies in order to address the critical scientific issues in a way that contributes to and leverages ongoing and upcoming broader community activities. The workshop will have four closely connected themes – i) convection observations, ii) convection modeling, iii) air-sea interaction observations, and iv) air-sea interaction modeling, as seen in the schematic below. These themes will be discussed within the context of progress and lessons from past activities, gaps in understanding and modeling, technological advancement, and broader scientific community activities. The overarching objective of the workshop is to identify key scientific problems that could benefit from coordinated modeling and observational efforts and potentially drive future process studies involving the tropical convection and air-sea interaction communities. The workshop will bring together scientists and other experts involved in research, observational and modeling technologies, and ongoing community efforts. The Organizing Committee anticipates that about 80-100 scientists will attend. Registration will be on a first-come, first-served basis until capacity is reached. Limited travel support is available for early career scientists, and a short application form will be provided during registration. Abstracts can be submitted for poster presentations and a limited number of oral presentations (Note: abstract submission is not required to attend the workshop). The Organizing Committee will review abstracts and early career travel support requests and make decisions in January 2019. The registration and abstract submission is closed. The meeting will be for two and a half days, consisting of plenary sessions including invited talks, a poster session, in-depth plenary and breakout discussions, and a networking event. A more detailed agenda will be coming soon. In addition to sharing of knowledge and ideas among the participants, the workshop will result in a report that summarizes the progress and lessons over the last 30 years in the four themes of the meeting, identify key scientific problems that could benefit from coordinated modeling and observational process studies, technological advancements, and coordination with the broader scientific community. A journal article (e.g., BAMS) will also be written, summarizing the outcomes of the workshop. Antonietta Capotondi, NOAA Earth System Research Lab. Sue Chen, Naval Research Lab. Chidong Zhang, NOAA Pacific Marine Environmental Lab.